Rising violence against bus drivers has sparked a recruitment crisis which is threatening some services, it is claimed. Two of the largest bus companies in the north-east of England say together they are short of about 200 drivers. 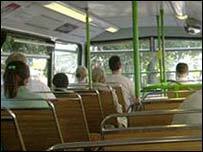 Union leaders say the problem is due to an increase in violent attacks and anti-social behaviour on public transport. One of Britain's biggest bus firms, Stagecoach, says it is down by 50 drivers in Newcastle alone. Rival firm Go North East, which has four subsidiaries in the region, has 140 fewer drivers than it needs. The companies have warned if the crisis is not resolved they will have to consider reducing services. Alan Gray, regional organiser for the Transport and General Workers' Union (TGWU) blamed the crisis on an escalating number of attacks on drivers. Mr Gray said called on the industry to do more to protect drivers. A newly-qualified driver is paid an average salary of £11,000 in the north-east of England. Several bus companies have introduced security measure in an effort to better protect drivers from attack. Many buses now have CCTV cameras installed. And in some areas undercover and uniformed police officers travel on buses at night in problem areas. Recruitment is not the only problem facing bus operators in the North East. In July, Nexus, which has responsibility for public transport planning in Tyne and Wear, said some services were in "imminent danger" of being withdrawn because too few passengers were using them. Nexus claims the overall situation across Tyne and Wear is worsening as bus patronage falls.